Hera is one of the most famous of the Greek goddesses, although she is often simply thought of in terms of being Zeus' wife. In Greek mythology though, Hera was an important deity in her own right, for she was the Greek goddess of women and marriage. Hera was born at the time when the Titans were the supreme deities of the cosmos; Hera indeed was the daughter of the supreme god Cronus, and his wife, Rhea. Rhea would give birth to six children, but Cronus was wary of his position, and a prophecy that stated he would be overthrown by his own child; so each time Rhea gave birth to a child, Cronus would imprison it within his stomach. Thus, in most versions of the Hera mythology, the daughter of Cronus spent her formative years within the stomach of her father, alongside Hades, Hestia, Demeter, and Poseidon. Only one child of Cronus escaped the fate of his siblings, and that was Zeus. Zeus would eventually return from hiding in Crete, and would force Cronus to regurgitate his prisoners when his father drank a special potion. Zeus would then lead his brothers in the Titanomachy, the ten year war against the Titans. During the war, Hera was said to have been in the care of the Titans Oceanus and Tethys, water gods who were neutral during the war. After the war the gods of Mount Olympus would usurp the Titans, and the Zeus became the supreme deity, lord of heaven and earth, whilst Poseidon became lord of the sea, and Hades the lord of the Underworld. Eventually, Zeus would decide that he needed a consort to rule alongside him, but after being wed to Themis and Metis, Zeus would make Hera his wife. Zeus would form of a council of 12 on Mount Olympus, the Olympian gods, who would rule, although Zeus' word was law. Hera would act as counsel to her husband, offering guidance, but there was also occasion when she would revolt against her husband plotting with other gods. Hera would induce Hypnos to put Zeus to sleep; and she would also conspire with Athena and Poseidon to overthrow her husband, although Hera was thwarted in this attempt through the actions of Thetis. 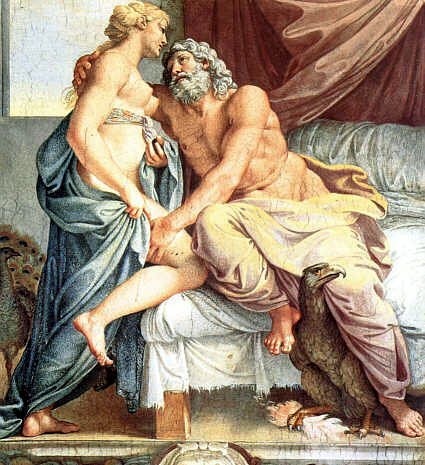 Despite being married to Hera, Zeus was far from monogamous, and Hera would ultimately spend much of her time dealing with the lovers of Zeus, and taking vengeance on the offspring produced. Famously, Hera would ultimately cause the nymph Io to wander the earth whilst in the form of a heifer, after almost catching Io and Zeus together. Hera would also be responsible for sending the monstrous Python to harass the goddess Leto; Hera having discovered that Leto was pregnant with the offspring of Zeus, Apollo and Artemis. Apollo and Artemis were not persecuted by Hera like other children of Zeus were. The persecution of Heracles by Hera is one of the most famous stories of Greek mythology, and right from the birth of Heracles through to his death, Hera would send multiple monster and enemies against the Greek hero. Dionysus would similarly be threatened many times by Hera. Hera herself would have children by Zeus, but overall, despite being the Greek goddess of Motherhood, Hera is only considered to be mother to four children. With Zeus, Hera would become parent to Ares (God of War), Eileithyia (Goddess of Childbirth) and Hebe (Goddess of Youth). The most famous story of children born to Hera though, was not a child of Zeus, for this child was Hephaestus. Hera was angry with Zeus, not for the first time, for the god had effectively given birth to the goddess Athena; in retribution, Hera brought forth her own child without a father, for she slapped her hand on the ground. The god born was Hephaestus, but the child was ugly and deformed. Hera decided that she could not be associated with such an ugly child, so the baby was thrown from Mount Olympus. He would be rescued though and grew up to be a great craftsman producing pretty jewellery and magical machines. Hephaestus would return to Mount Olympus, bringing with him a magnificent throne, but when Hera sat on it, the throne trapped her. Hera would only be released when the Zeus promised Hephaestus the hand in marriage of the beautiful Aphrodite. The name of the Greek goddess Hera appear in multiple stories from most writers in antiquity, but she is prominent in three of the most important stories of Greek mythology. Hera is a central goddess during the Trojan War, for she was one of the goddesses slighted, alongside Athena, when Paris chose Aphrodite during the Judgement of Paris. Subsequently Aphrodite would be a supporter of the Trojans during the war, whilst Hera and Athena would support the Achaean Greeks. Hera is also the guiding goddess of Jason during the adventures of the Argonauts. Hera was manipulating Jason for her own ends, and the goddess was integral in ensuring that Medea fell in love with Jason, allowing for the capture of the Golden Fleece. Arguably Hera though is most famous for her role in the adventure of Heracles, for as we know each task asked of the Greek hero was ultimately designed to kill the illegitimate offspring of Zeus.